The first Episcopal services in Asbury Park were held in 1873 in the main office of none other than James A. Bradley, founder and benefactor of the City. One year later, the first “regular service” was held in a tent on what was later known as Library Square. Permanent and summer residents alike joined in deciding to erect a church building on the lot located opposite the tent, on the corner of Asbury and Grand Avenues where our present church stands. Land was deeded by James Bradley and by July 23, 1875, the 30 by 60 foot wooden Gothic-style structure was completed. The interior of the church filled about one-half the area of the present building. The wooden church was consecrated by Bishop John Scarborough on September 14, 1880. It was lost to fire. The building as we now know it today was built over a period of several years — with the cornerstone laid on December 30, 1908. The task of raising money to pay off “all debts and encumbrances” so that the church could be consecrated then took 9 1/2 years; finally, on June 15, 1919, the current building was formally consecrated as “Trinity Church.” The architect, Mr. Brazer, was only 27 years when he designed our church. He is still well-known for several notable works, including the beautiful Capitol of Puerto Rico. His prominent local family included the founders and publishers of the Asbury Park Press, many of whom worshiped at Trinity and endowed the building with beautiful memorials. Mr. Brazer conceived of our church as a “stone edifice in the best style” of English perpendicular Gothic, which flowered in England from 1350-1550. The building he designed is filled with magnificent artistry. The windows are of Antique English style with delicate limestone tracery, and are enriched by stained glass created by some the best artists of the United States, England, and Germany. The terracotta tile in the sanctuary was created by artists at the Moravian Tile Works. The Aeolian Skinner organ is one of the finest instruments in New Jersey. 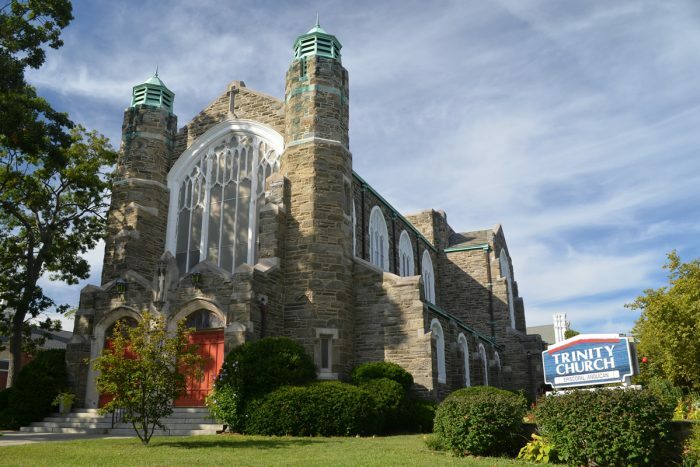 When completed, the building cost $42,790, a huge sum at the time, and Trinity Asbury Park was widely recognized as one of the great church buildings in New Jersey. The cost today to build such a glorious structure would be phenomenal. But, the real value of this space is that it has been a sanctuary for countless thousands seeking God, and a beacon of outreach and hope to the people of Asbury Park and beyond. Throughout the middle of the 20th century, Trinity experienced continued growth, as well as the dramatic expansion of church facilities — including renovation of the Church and office wings and the building of a new education wing and gymnasium. In terms of attendance, the parish reached its largest numbers in the mid-sixties and has re-achieved that scale in the early part of the 21st century. Like many urban areas in New Jersey, however, Asbury Park suffered greatly during the seventies and eighties. Loss of tourism and industry led to increased poverty rates — which led to absentee landlords and the loss of much of Asbury’s middle class. Throughout the past two decades, Trinity has re-engaged in a dramatically changed Asbury Park community, looking for new ways to serve. Our membership has grown in both numbers and diversity. Our outreach toward the surrounding community has increased substantially, with a number of new programs being instituted. We are once again a strong, healthy parish. The parish continues to grow in its constituency — deliberately and willingly inclusive. Members, leadership and staff are white and black, gay and straight, rich and poor, liberal and conservative, women and men, younger and older. We have come to see in God’s call to us a model of Christian life that sees holiness in diversity and change, in service and humility, in love and care freely given, and without expectation of reply. We can no more anticipate the future than could those who came before us, but we know, that so long as the people of this Church listen for that small voice of love, which is God in this world, our future is secure.